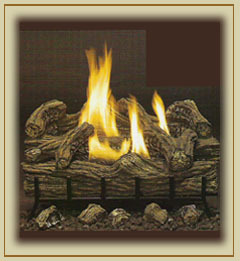 Monessen Hearth Systems offers the largest variety of radiant heat producing vented logs in the industry. All Monessen vented gas logs feature innovative, artistically crafted log designs and burner styles that produce dancing yellow flames, glowing embers and warm comfortable radiant heat, up to 22,000 Btu. Monessen also features a milited lifetime warranty on all vented fiber ceramic and refractory logs.